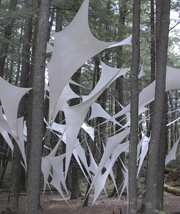 To manage forest health concerns in the forests, guidelines are often developed to minimize the threat increasing the spread during timber harvesting. Specifically, Wisconsin had recently adopted guidelines for two disease threats: Heterobasidion root disease (aka, annosum root rot) and oak wilt. Heterobasidion affects conifers, while, as the name implies, oak wilts affects oaks, though red oaks (e.g., northern red oak, pin oak) are more susceptible than white oaks (e.g., white oak, bur oak). Due to forest certification, Managed Forest Law enrollment, and concerns over the long-term health of their forests, landowners (public and private) may require as part of their timber sale contract that loggers implement disease guidelines. For oak wilt this most often takes the form of a seasonal restriction to minimize likely infection that might occur due to wounds to a tree’s bole, limbs, or roots. Heterobasidion root disease guidelines reduce the risk of spread through the treatment of cut stumps soon after harvesting. This can be done by hand or by an attachment added to mechanized logging equipment. Over half of logging businesses reported bidding on sales requiring oak wilt guidelines, while 16% reported bidding on sales requiring heterobasidion treatments (see below). The difference is not particularly surprising given the distribution of oak across the state versus conifers. This is evident in the primary reasons cited for not bidding on such sales. 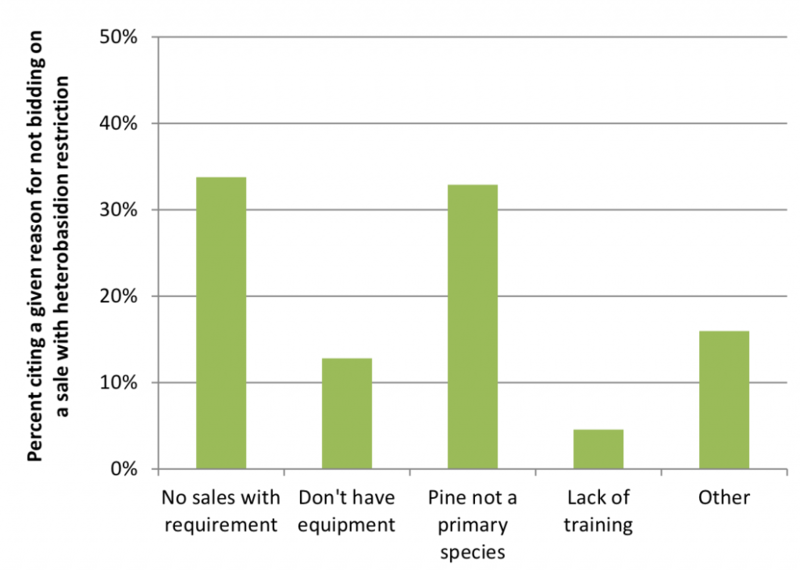 Two-thirds of respondents indicated that they didn’t bid on sales with heterobasidion root disease guideline requirements because none of their sales had the requirement or because pine was not a primary species they cut. Under 20% indicated the reason was either not having the proper equipment or training (see below). 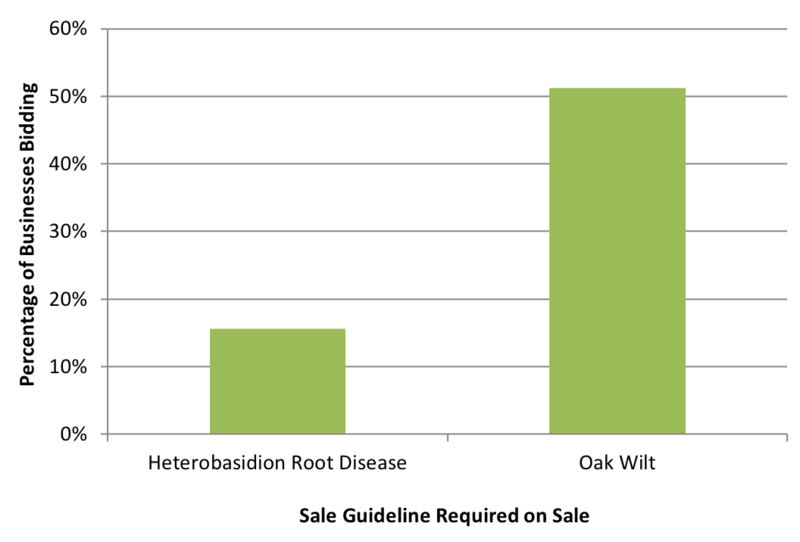 For oak wilt, top reasons cited for not bidding included “no sales with requirements” (41%) and oak not a primary species (28%, see below). 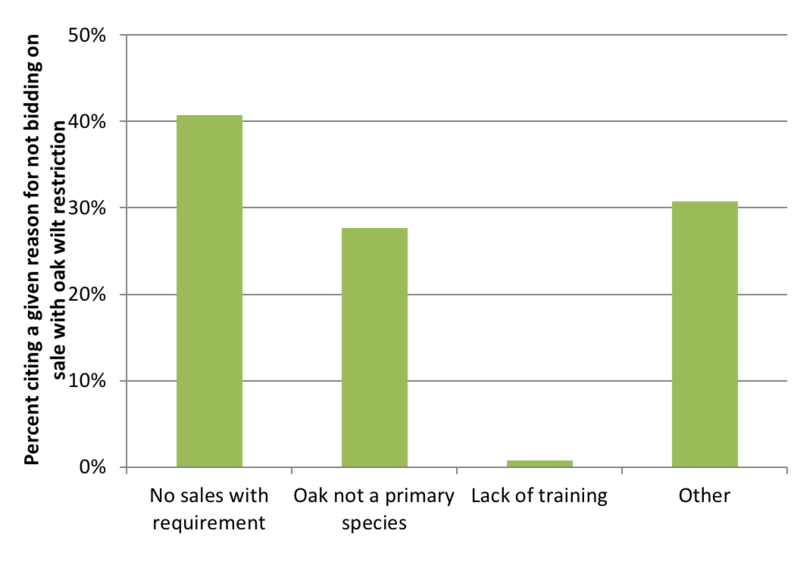 Those citing lack of training on oak wilt guidelines were only 1% of question respondents. For both guidelines, the “other” reason category accounting for a substantive portion: 16% for root rot and 31% for oak wilt. When reviewing the open-ended responses, a common response indicated that the logging business didn’t bid on sales and relied primary on contracts from mills. It is was also clear that a small number intentionally sought out sales without such restrictions.